Some recollections from 1981's "great race"
The words a road crew hated to hear! A meeting place to communicate with other railfans about every aspect of the railroad hobby. Over 11,000 visitors daily with thousands of new messages posted every week. View railroad videos uploaded by Trainorders.com premium users. 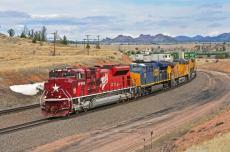 We have the largest collection of online train video on the internet. Our new video index offers an easy to use interface for watching videos. Our previous library contains over 3000 videos covering the 1950's through today. Our image library includes over 100,000 images submitted by our membership. Our easy to use system will allow you to browse the library. Members of Trainorders.com receive 50 megabytes of web space to build a web site. We do not require the display of advertisements, nor are there restrictive bandwidth limits. Find other members that are close to where you live. Trainorders.com is so large that the chances are another enthusiasts is close by. Members post your railroad related classified ad. If you are new to Trainorders.com take a tour of our features and learn why our premium site is a great value for railfans. It is easy to become addicted to our web site as it provides hours of daily entertainment. HO Scale Joshua Trees for your model train layout hand built by Mason. Mason is the son of the site owner. Electric car charging web site. A little web site hosted on the Trainorders.com web servers. It has nothing to do with trains.